Alwine Security provides a wide selection of access control systems ranging from a single door controller, PC based platforms, integrated systems, PoE (Power over Ethernet) readers, and managed access control. What is an access control system? 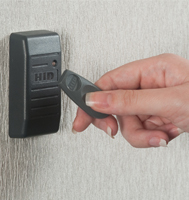 Unlike your ring of building keys, access control systems offer business owners the ability to manage who can go where in your facility as well as when. Access control systems are critical for your facilites control and safety. Locked doors protect your employees, your clients, networks, and property. Whether you need to secure a set of doors at one location or hundreds of doors at many locations, our professional and experienced consultants will customize an access control system for your Lancaster, PA business to meet all your needs.